“So far, it’s been pretty easy to avoid consuming genetically-engineered food. 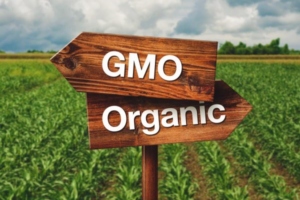 Buying organic and looking out for Non-GMO Project verification can give you assurance that you’re not getting anything genetically engineered. Could all that be about to change? A new wave of genetically engineered food is about to hit the market, and loose regulations will make it harder to distinguish these foods from their natural counterparts. This means it’s going to start taking a far greater effort to know what to look out for in the grocery store and at restaurants. Take the example of the “Impossible Burger.” This plant-based burger “bleeds” just like a beef burger would thanks to yeast that has been genetically engineered to resemble the leghemoglobin in soybean roots. When this soy leghemoglobin breaks down into a heme protein, it gives the burger a blood-red hue and makes it sizzle when grilled. Supporters tout its clever skirting of the ethical problems posed by meat production, but is it ethical to try to pass this off on humans as real food? After all, the GMO soy leghemoglobin breaks down into 46 proteins that humans have never consumed, so no one knows what risks it could pose. When the company that produces the burger asked the FDA to confirm it was “generally recognized as safe,” the FDA essentially refused, saying that its safety for human consumption hadn’t been established – and the FDA isn’t exactly known for being strict about such matters, so that’s really saying something. However, the company didn’t need FDA approval to sell it anyway, so it’s now being sold in restaurants, where some diners have been erroneously told it’s not genetically modified. Protect yourself and your family by reading all labels, and if you can’t find out if they are GMO safe, look up the product and company online asking if their products are GMO free. And be sure to take care of gut health by taking Aloe Apex every day.